LET'S GET THIS PLACE UP AND RUNNING AGAIN! 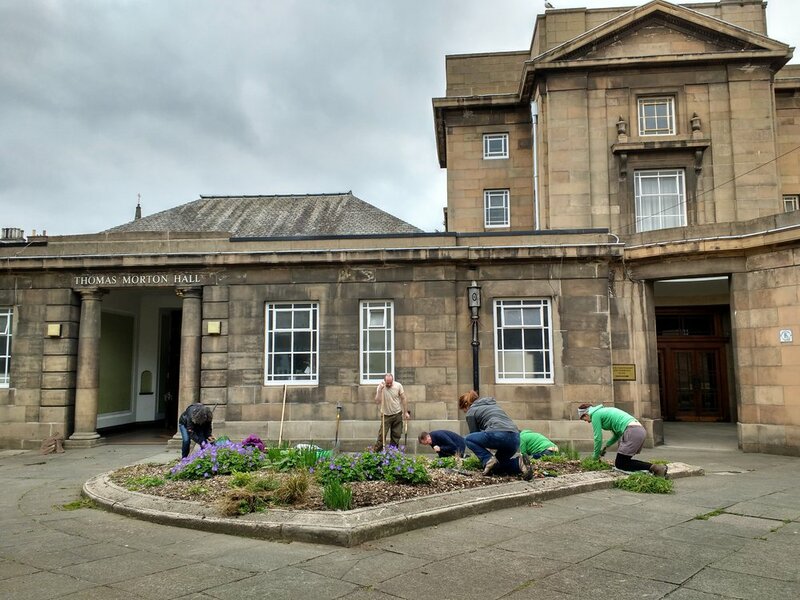 DIY- Our small band of DIY Volunteers help maintain the building by clearing debris, painting, varnishing, carrying out small repairs, moving furniture, organising storage, preparing the theatre for events, and cutting back vegetation at the back of the theatre – anything that needs doing. You don't need to be a DIY expert (although you're very welcome if you are! ), but do need to have a reasonable level of physical fitness. Gardening - Our Gardening Volunteers have transformed the small garden area at the front of the building since the summer of 2016. We plant and maintain the two flower and shrub beds and the plant boxes, sweep the paths and generally keep the entrance area tidy. There is always some weeding to be done. Events - Our Event Volunteers help us run a variety of events, doing everything from helping to set up before an event, to meeting and greeting guests, to stewarding, to clearing up at the end. If you like working with people, making things run smoothly and are able to work an occasional evening or at the weekend, apply to join our events team! This is an occasional commitment. WHEN - For most of the year, our DIY and Gardening volunteer sessions are on Sundays, starting around 11.00 or 11.30am and lasting for 2 -3 hours. We don’t meet every Sunday and try to give a couple of weeks’ notice of each Sunday session. In the summer months, we have some volunteer sessions on weekday evenings, making use of the long hours of daylight and keeping everyone’s weekend free for other things. Please note that at the moment (October 2018) we have limited tasks for DIY volunteers as plans are still being developed for the refurbishment of the theatre. Tasks will be mainly moving furniture, cleaning, etc. We are happy to accept applications for DIY volunteers and you will be informed of all future activities. We hope that there will be some specific DIY projects for volunteers within the next year. WHERE CAN I SIGN UP?! FILL IN THE BELOW APPLICATION FORM AND PRESS SUBMIT. Your information will be sent directly to volunteer@leiththeatretrust.org and one of our volunteer coordinators will add you to the appropriate team! Best to reach you on.